We are not your typical guest ranch. We are a small guest ranch with approximately 25 guests per week, to keep our guests’ experience personal. Our guests leave The Hideout feeling as though they are not guests, but family. Elevations in this area range from 4,200 to 13,200 feet and offer a unique variety of terrain and scenery resulting in a broad range of climates and biodiversity. With close to 650,000 acres to explore you will seldom ride the same trail twice or feel crowded. During the summer months and spring breaks we host a growing number of families with older children and young adults. We believe that part of a family vacation involves parents and children participating in, enjoying and sharing the same experiences. We do not offer a formal “children’s program”. We strive to treat children as young adults and to offer them the full Hideout Guest Ranch experience. Our experience is typically focused towards adults and families with older children who have some equestrian experience or are in good physical condition. The Hideout welcomes children 8years of age and older. Because we do not have a children’s program parents are required to supervise and go along with their children on all riding and non-riding activities. Most of our visiting families are eager to learn new things while exploring and enjoying new experiences together as a family. They are looking to build long lasting, exciting and interesting memories. This is a life changing vacation experience. It is fun and adventurous, but families will also learn about ranching, farming, horses, nature and will meet other guests from a variety of countries and cultures. In addition to our more mature year-round staff, we typically employ a number of younger wranglers during the summer months. Our family and staffs’ families represent all ages from 11 to 80 years of age, which makes The Hideout a multigenerational vacation destination. Our year-round wranglers are more mature and geared to the adults that travel to The Hideout. However, we do have many adult travelers in the summer season also. Due to the fact that we have a minimum age requirement and do not offer a children’s program, the families who come to The Hideout treat their children as young adults. With the small number of guests at The Hideout, we are able to keep your vacation personalized and exactly what you are looking for. The Hideout is an excellent destination for solo travelers. Solo travelers will find the size and concept of The Hideout Lodge & Guest Ranch a very easygoing and welcoming vacation. Because of its small size, friendly and accommodating staff, strong interaction with the owners and management and the family-like atmosphere, you will feel part of the family the very moment you arrive at The Hideout Lodge & Guest Ranch. At The Hideout Guest Lodge & Ranch we strive to offer excellence in hospitality, lodging and culinary pampering. Usually we accommodate 15 to 25 guests a week, which allows us to keep it personal, authentic and as customized as possible. Many guests come back each year because of our staff. We hire using The 3 C’s of Character, Conduct and Competence and invest in the training and general well-being of our staff. With a one to one staff to guest ratio we do not cut corners when it comes to service and hospitality. To us preparing food is more than putting food on the table. It comes with the warmth and hospitality you expect when you go to your mother’s or grandmother’s house to visit. Our kitchen is more about quality and serving healthy food than quantity. We cater to most diets within reason. While we would not consider ourselves a resort our cabins are very clean, well decorated and very well maintained. The Hideout is well-funded and all our profits are re-invested in maintaining and improving our guest ranch to the benefit of our guests. ​If you ask our staff and growing number of repeat guests and guests from around the world why they come to The Hideout, they will tell you about the variety of reasons they return to The Hideout. Some will point out that we try hard to make sure this year’s visit is as good as last year’s visit making sure to add a little something to it. They will talk to you about the quality of our horses, staff, tack, equipment and how well kept the cabins and grounds are. Others will tell you that we combine a traditional ranching culture with a progressive eye on the future, caring for the eco-system and lands we use. Our guests return to The Hideout Lodge & Guest Ranch because of the warmth of our hospitality, and because our ranch is managed by a well-traveled family and staff that knows how to excel and wants to please. Our guests enjoy high-end pampering and excellent, healthy food created by a culinary-schooled chef who cares and goes the extra length with a smile. We take pride in having an enthusiastic staff, many of whom reside with us year-round. The main reason we have a great team of people is because we treat them as family. We want The Hideout to be the best place to work so it is the best place for you to vacation. Whenever our staff talks about our ranch they use the words “we” and “our”. We believe that’s the finest proof that they take pride and ownership in what they do. Our repeat guests will tell you about our quality, well-maintained grounds and clean accommodations. They appreciate that we always strive to make each visit better than the last. It’s commonly referred to as “The Hideout Experience”. We like to offer an authentic, personalized ranch boutique experience by limiting the number of guests to approximately 25 riders per week. If horseback riding, herding cattle and enjoying the great outdoors in Wyoming is your idea of a perfect western vacation then The Hideout is ideal for you. We have a variety of horses that are well taken care of and can be matched to any riding-level. The Hideout Lodge & Guest Ranch is not your typical “Nose to Tail” dude ranch, but is a working cattle, horsemanship and riding ranch. Each rider will be matched to a horse based on their riding ability and will experience the vacation they were looking for. Advanced riders will find hundreds of thousands of acres to ride on great horses with experienced and knowledgeable cowboys, wranglers and guides. Beginner riders will find patient teachers and instructors who enjoy sharing their love and passion for riding. Every level of rider can participate in cattle work, contrary to what many people think. Our horse program is managed by AH Horsemanship & Training and every year several clinicians visit The Hideout for training, clinics and to ride with our staff and guests. The key to Authentic Horsemanship is having an open mind towards horsemanship, riding and horses and the desire to continue learning where we can. Our string of horses consists of excellent Quarter Horses of fine bloodlines, well-bred Paint Horses, cow and trail horses, and over the last two years we have been adding more and more well trained Mustangs to our herd. Guest RanchTogether with our fly-fishing guide who manages our fishing property, we fish over 10 miles of streams, creeks and lakes having access to approximately 650,000 acres in a variety of eco-systems. In addition to the streams, we have access to well-stocked casting ponds and easy or more challenging streams. In search for excellence, our guides also fish other lakes, streams and ponds in The Big Horn Basin and Yellowstone Region at elevations ranging from 4,200 to 10,000 feet. With a population of 2 people per square mile (compared to New York City with 27,000 people per square mile) you will seldom be crowded while you fish, ride or hike on this ranch. Our fly-fishing guides have excited both advanced fly-fishers as well as beginners from around the world with the experience we offer. We only offer those activities in which we can excel for our visiting guests. You will not only learn about casting techniques but also about the streams, the insects, how to protect streams and stream banks for the future and what it takes to be a pro. This area offers German and Loch Leven Browns, Cutthroat, Yellowstone Cutthroat, and Rainbow as well as Brook and Lake Trout. We also see Mountain White Fish, Golden Trout, Splake and Grayling. As friends of the fish, we are 100% catch and release and we will teach you how to release fish properly after catching it, so it can continue to roam the clean, pure waters of Wyoming. Occasionally we will take some “brookies” home. During the summer season our fly-fishing guide also offers Fly-tying lessons. ​With all the terrain to explore on private lands, BLM, The Big Horn National Forest and Cloud Peak Wilderness, the ranch is an adventure all on its own. With elevations ranging from 4,200 to 13,200 feet, we have an almost unheard of diversity of scenery, climates, and bio-diversity. We offer an array of non-riding adventures such as trapshooting, archery, fly-fishing, canoeing, kayaking, attending The Cody Nite Rodeo, hiking, biking, guided tours, 4×4 tours, ranch and farm visits, etc. Add to this the diversity of cultures, languages, generations and backgrounds of our staff, family and guests from around the world and you will find out why we are not considered “Your Typical Guest Ranch”. Many of our guests come to The Hideout looking for an experience that blends equestrian activities, the remote outdoors, an authentic ranch experience and upscale pampering. Guests arrive from around the world and return frequently. They have many stories to share about The Hideout, but they will all agree that the reason they return is “The Hideout Story”. In the end, returning guests and word of mouth are the only benchmarks for any organization. We do not take this for granted. On the contrary, it puts more weight on our shoulders to do better every year. David Flitner and Paula De Cabooter-Flitner founded Hideout Adventures Inc. in 1992. In 2006, Peter De Cabooter (Paula’s nephew) and his wife Marijn Werquin took over the reins and have expanded The Hideout to what it is today. The Hideout Lodge & Guest Ranch is an upscale riding, working, adventure guest ranch and independent ranch that operates year-round. While David continues working with his son Greg on the operational ranch, you will see Paula who turns 80 in 2017, still actively involved in the Guest Ranch. Paula, like Marijn and Peter, is a Belgian native, who moved to the US almost 60 years ago. She has lived, among other places, in New York, California, Florida, Belgium, France, and Switzerland and has traveled throughout the world. Peter, leaving an international corporate job, moved with Marijn and their twin sons Edward and Victor from Brussels to Shell, Wyoming. The Hideout welcomes a growing number of visitors from around the world each year, and leverages diversity as an asset. In 2012 Rebecca and Tom Bercher with their children Augustus and Seamus, joined The Hideout crew moving to Shell from Northwest Arkansas. Prior to this Rebecca and Tom had been guests at The Hideout three times. Tom is The Hideout’s head wrangler and Rebecca manages the office, reservations and guest services. Over the years The Hideout has evolved from a predominantly working cattle guest ranch to become one of the foremost upscale riding ranches in North America. However, we remain loyal to our commitment to offer one of the best working cattle ranch experiences out West. Even during our high season we limit our riding guests to approximately 25 per week. ​riding string for intermediate and advanced riders. 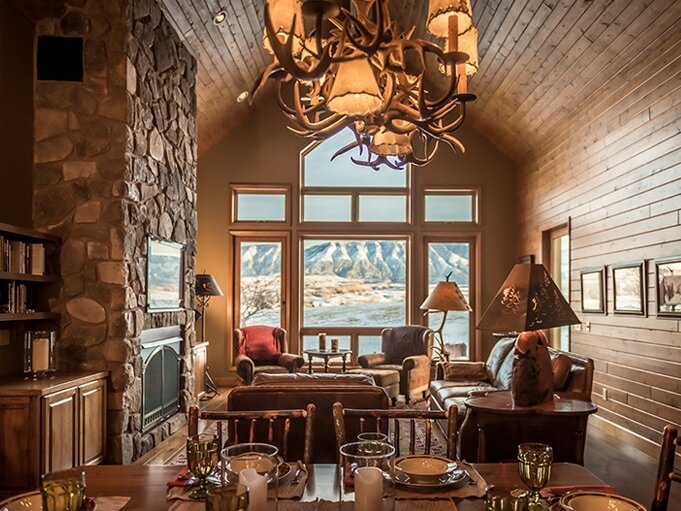 Jackson Hole-Style Luxury at The Hideout Lodge & Guest Ranch in Shell, Wyoming. ​Some people think that unless you stay in Jackson Hole, a vacation in Wyoming is a rustic cowboy-style retreat where you have to rough and tough it out in the name of authenticity. While this might be true for some ranches, this has never been the case at The Hideout Lodge & Guest Ranch. Our cabins, lodge, and culinary experience can compete with the best resorts worldwide. The Casitas are one and two bed-bedroom cabins. 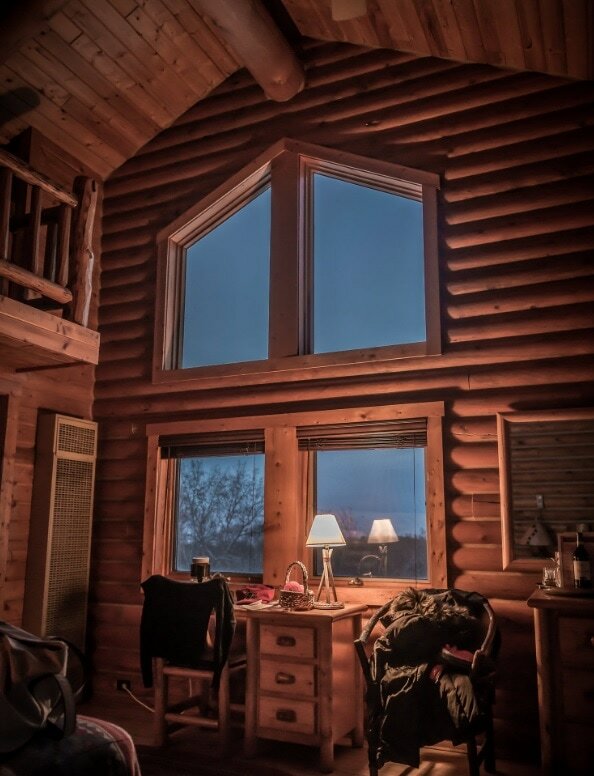 They are located in a two-story, four-unit log building with back porches overlooking the orchard and Shell Creek. Your view guides your eye toward Shell Canyon and the spectacular Bighorn Mountains beyond. The Casitas are a short walking distance from the Main Lodge. The Hideout Lodge & Guest Ranch is well-funded. We do not cut corners on maintenance and improvements. (Extra wine, beer and liquor may be purchased in the gift shop). • Ever-changing vistas of Shell Canyon and the Bighorn Mountains. 2 of The Casitas have one bedroom, a living room with sofa and kitchen. 2 of The Casitas have no kitchen, but instead one main room with a king bed and sitting area and a second separate bedroom with a queen size bed. The Casitas have all been recently renovated. The Casitas are cleaned daily, and sheets are changed mid-week. The Hideout Lodge & Guest Ranch caters to your every comfort. 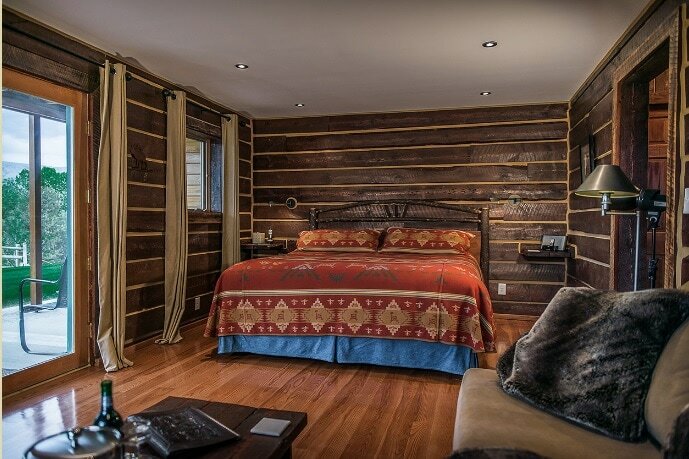 The Hideout Lodge & Guest Ranch caters to your every comfort. In addition to complimentary toiletries, we also provide hairdryers and bathrobes for you to use during your stay. According to our guests, The Casitas have the best view on the property. Our hearty Western fare and gourmet dinners are one of the main reasons our guests return year after year. The view from the dining room, where meals are served, is simply spectacular. We can assure you that excellent dining is taken very seriously at The Hideout. Each item is prepared with only the best and freshest ingredients. Most of our vegetables are local, organically grown and fresh from the garden. Many of our new and returning guests come from around the world and a growing number visit us from countries and areas known for their food culture. Needless to say our chef and her team needs to be creative and have an eye for quality. Our kitchen is less about quantity but rather about quality and healthy food. At The Hideout we eat well every day. All meals are included in your guest package. Each morning we serve homemade dishes such as eggs prepared any way you want them, pancakes, French toast, etc. In addition we also offer a breakfast selection at the buffet. For all-day rides, hearty sandwiches are freshly prepared in the morning to ensure The Hideout’s standards for quality. If you choose to participate in a half-day activity, a scrumptious lunch is served in the dining room of the Main Lodge. In the evening, we serve our guests western-style gourmet food, elegantly presented, with wine, beer or the beverage of your choice. Once a week (weather permitting) there is an outdoor cook-out where we serve juicy, marbled Certified Angus Beef along with a variety of other tantalizing food. Our chef is very creative and does not limit herself to serving meat only. We cater to most diets within reason. and at the Hideout, your taste buds will always be richly rewarded. The Hideout Lodge & Guest Ranch is your destination if you are looking for the unique combination of a real working cattle ranch, great riding, and world-class hospitality in remote country out West.